Welp! 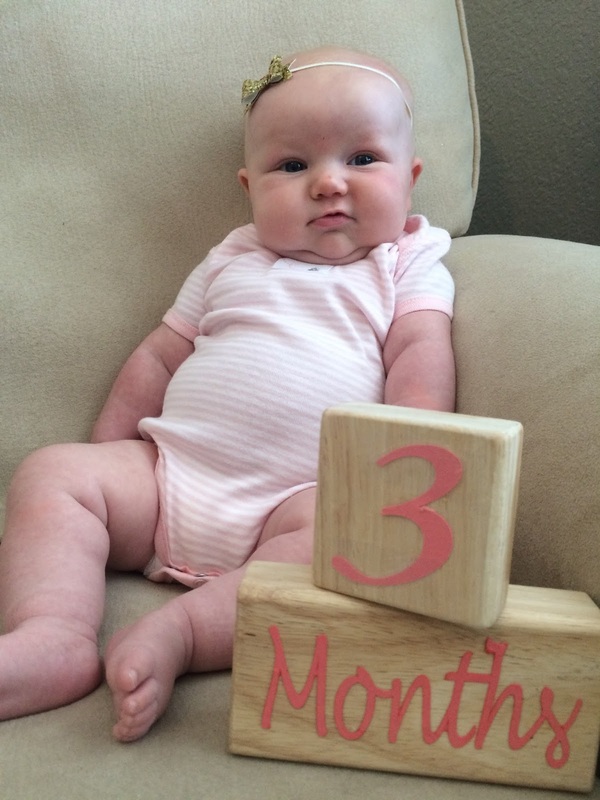 Another month has come and hurried by…and Lucy Violet is bigger, cuter (if that is possible) and more alert and interactive every.single.day! 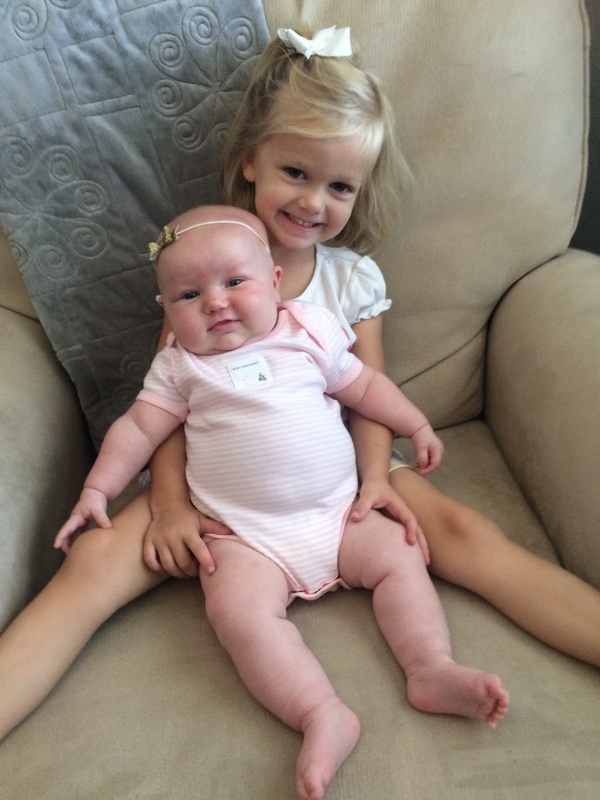 We just adore her and she is the HAPPIEST baby and must know her birth order, because she is VERY flexible! 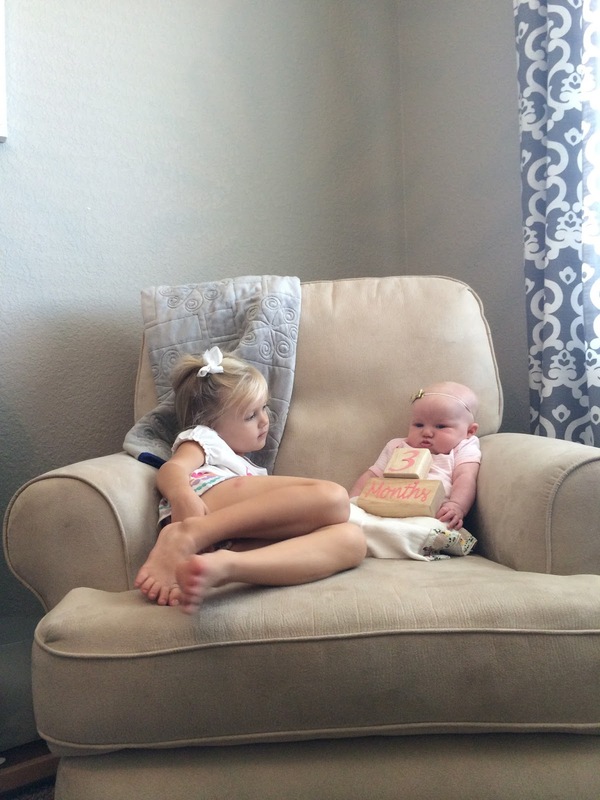 She smiles with her whole face and loves kisses from everyone…even her crazy siblings who are ALWAYS in her face. They both want to sit by her at the table so I got ousted from my seat ;). Can you guess who she was smiling at off to the right of the camera? Yes my photography assistant, Vera! She was very good at her job which was to make Lucy smile :). Lucy has the cutest teeny feet and chunky monkey thighes and just like her siblings cheeks for days and a round full tum-tum! We don’t miss any meals around here :). 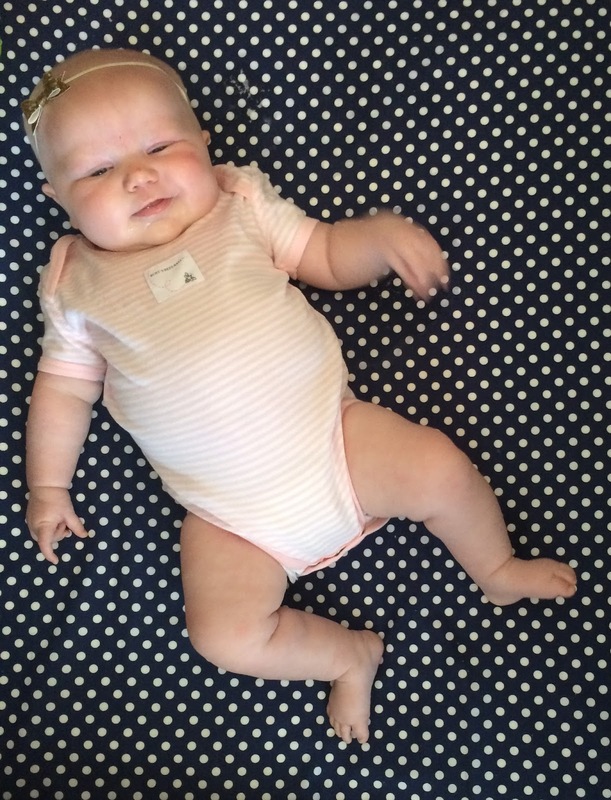 …and just to prove Lucy is put in her bed from time to time…here she is posing on her navy polka dot sheet! She likes to look in her crib mirror while I do laundry or put clothes away. 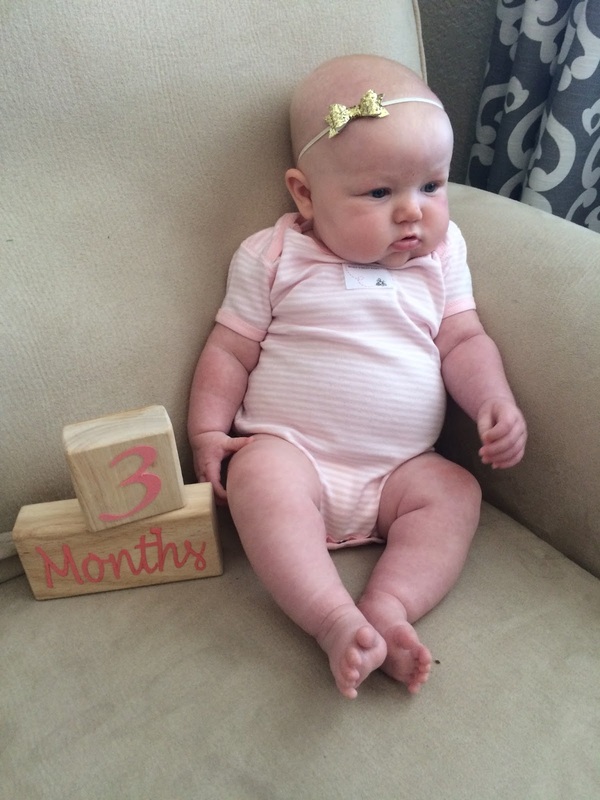 Lucy is now mostly in 3-6 month clothes and wears size 0 shoes (Someone has teeny feet, a family trait). Luckily it turned fall because Grandma and Mommy went shopping and get some cute things for her but it was all long sleeves. She has the cutest animal print tights on right now and sweatshirt dress…yummy! She is just moved into her room but still sleeping in the rock n’play. We are loving the video monitor so I can check on her in the night. She goes to bed around 9pm with a feeding and wakes up anywhere between 3:30-5am for a feeding and then back to bed until around 7:30am…unless she is woken up by the commotion around here. She is thankfully flexible on schedule because everyday is slightly different. She takes lots of naps in her car seat but occasionally naps at home in her rock n’play…lots of times mommy holds her too – yes she is spoiled and mommy loves every moment! She loves bath time and splashes her legs all around. She takes a bath every other night these days…she starts to smell like puke after a few days. She is still Miss Volcano after feedings and still dislikes when mommy eats tomatoes or anything TOO spicy. We still don’t do ANY dairy as well. She does NOT like tummy time at all so that lasts about 5 minutes a day. She does however like to lay on her activity mat and watch the lights and sounds on the display and look in the mirror. She now tolerates the mommaroo pretty well for 20-30 minute increments if mommy needs to clean or put her down (I am typing while holding her right now ;). She doesn’t mind her stroller ride to pick Solon up after school. The verdict is still out on the pacifier, she fights you hard and mommy seems to have the best luck getting her to take it. She really likes sucking on her hands and playing with her tongue. She loves to be sung and talked to and will coo back. When she is laying on the ground she kicks her legs and flails her arms LOTS. She poops the signature golden yellow poop a few times a day. The kids think it smells bad, just wait kiddos ;)! She went on her first hayride, sat in the corn pool and picked some apples at the orchard. She met some more PEO sisters at a meeting mommy hosted and has gone to 2 more ISU games. She knows her family and will light up when they pay her any attention which is all the time. She still prefers to be in mommy’s arms. Likes her high chair to watch the action while mom cooks dinner and likes to sit with all of us while we eat. Nurses every 3 hours for a total of 7 times a day. Will take a bottle begrudgingly if mommy is gone but sometimes will fast until mom gets home. Loves to be bounced and rocked to sleep. She really is the happiest, most flexible baby and I am so thankful. We have to be on the go with sibling activities and she is just a little ball of sunshine everywhere we go. 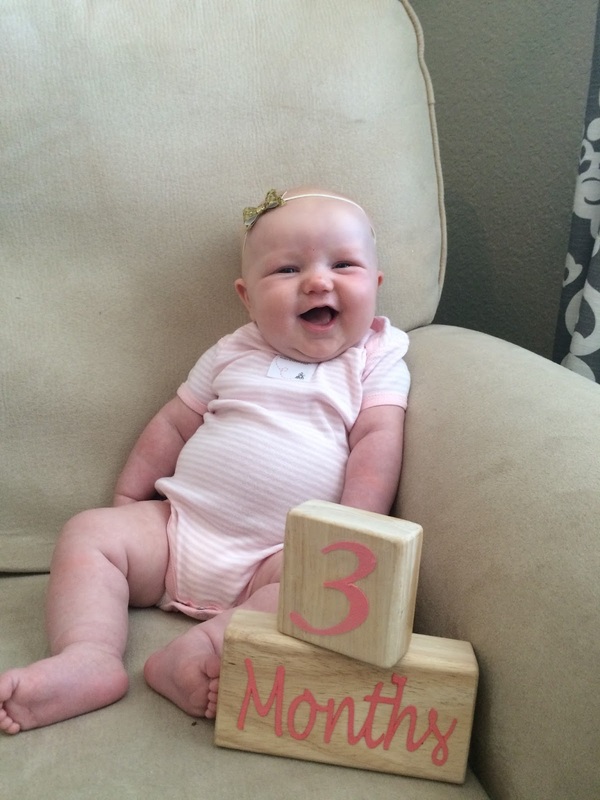 She has cheeks for days and a big smile for everyone. We love our little miracle and love watching every first she has. 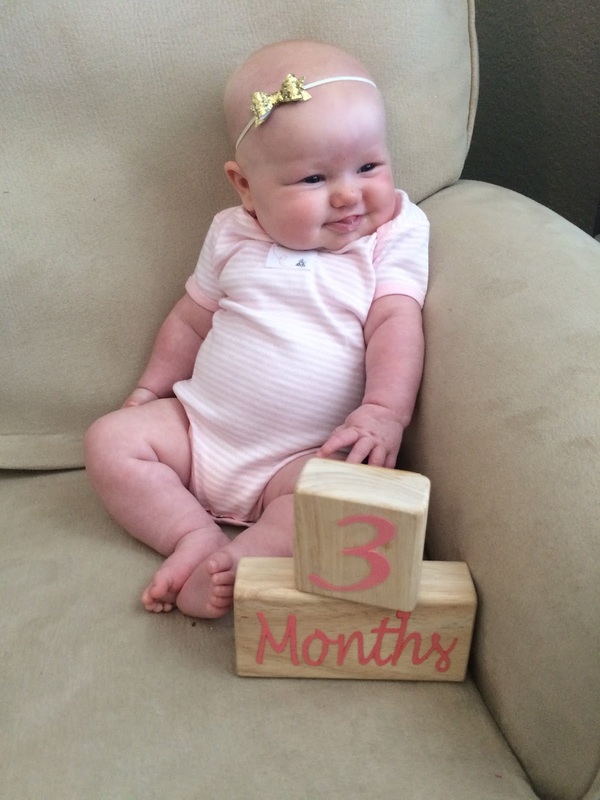 Here’s to another fun months of firsts and special moments with our sweet Lucy Violet :). You are the perfect completion to our family and we love you more than you will ever know!